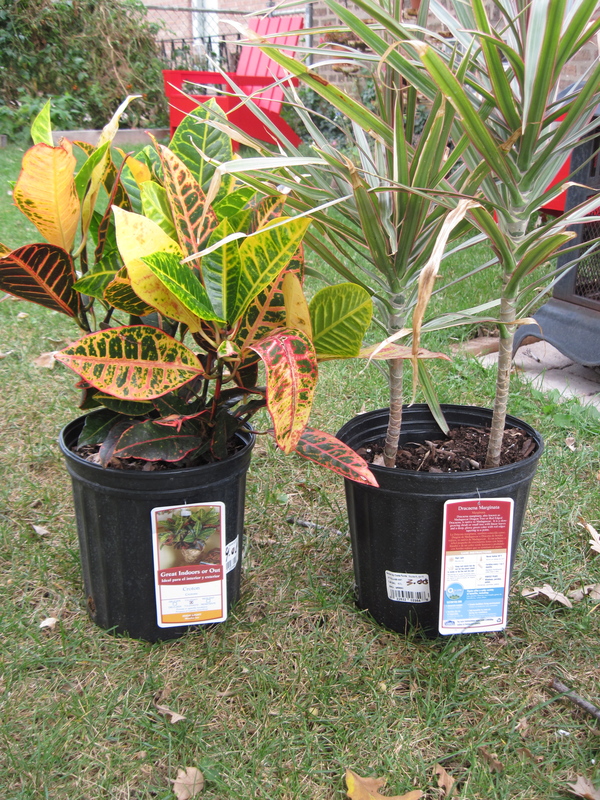 While searching for something totally unrelated at one of our favorite haunts (hardware store) the other day, we picked up these two houseplants. 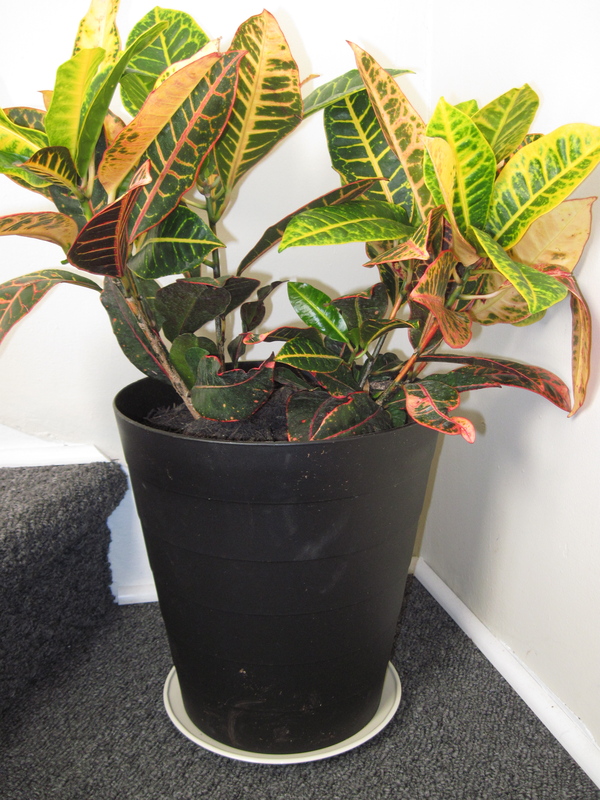 They’re a Dracaena and a Croton (crouton? mmm), and they’re a little worse for the wear, which is why they were marked down to 3 and 4 dollars. That’s also why they made it into our shopping cart. They still had a lot of life left in them, and after leaving them outdoors in the direct sunlight and giving them plenty of water for a couple of weeks, they were as good as new. 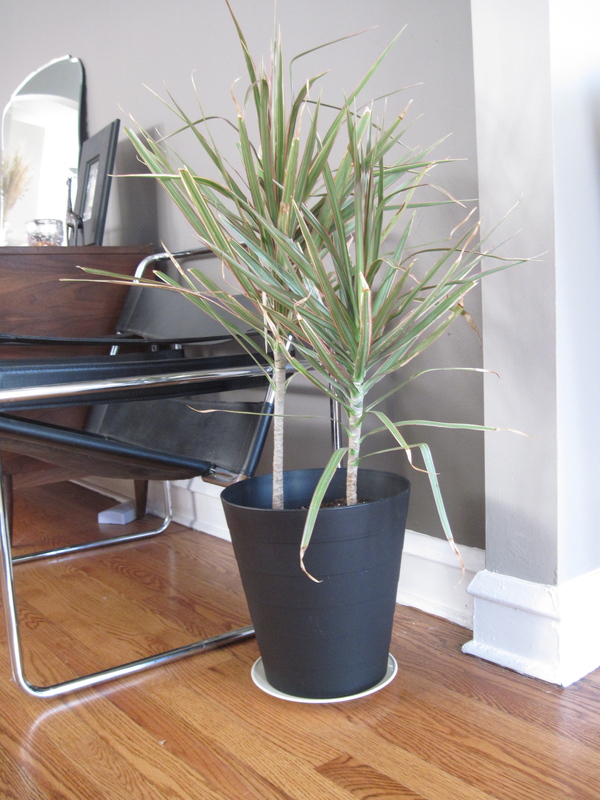 Problem is, they’re pretty big plants, and we definitely wanted to move them indoors, but we had no pots large enough to replant them in. We looked around a bit for something simple, modern and attractive, but we came up short. Everything was either very pricey, or cheap, flimsy and really ugly. So, for a while, they stayed in their little cheap plastic tubs until we finally came up with a solution. At only $1.99 and a little over 11 inches in diameter, it was perfect for our purposes. The plastic walls are actually pretty substantial, too. It was only a little deep, but that was something we could easily fix. 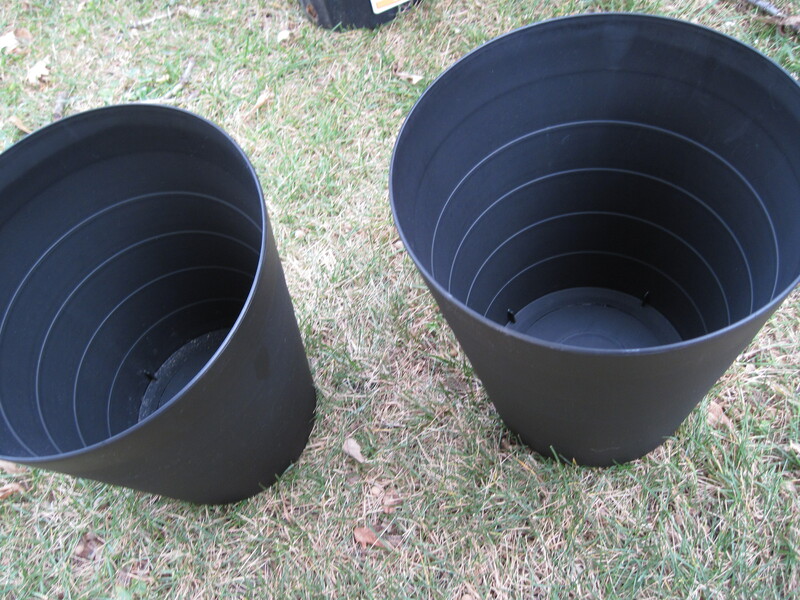 We picked up two wastebaskets and started by drilling a drainage hole in the bottom. 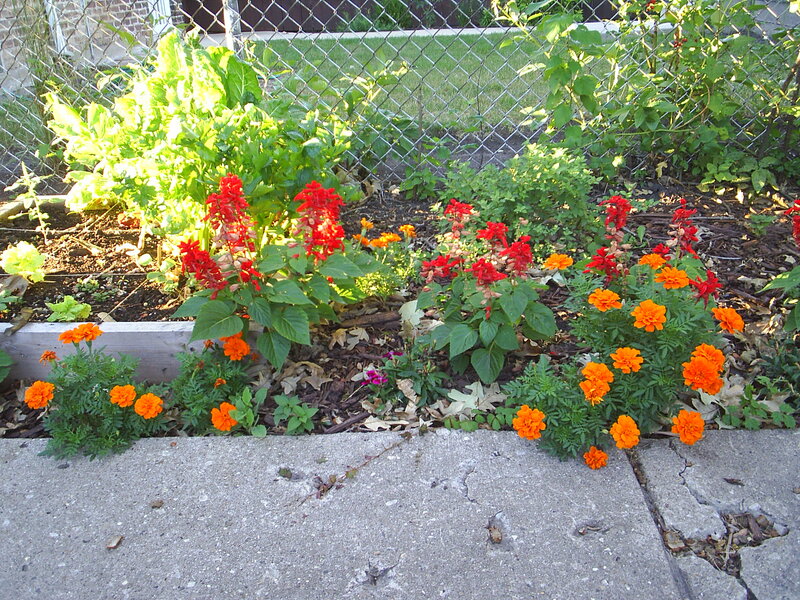 Next, we added some mulch leftover from our landscaping into the bottom of each pot. 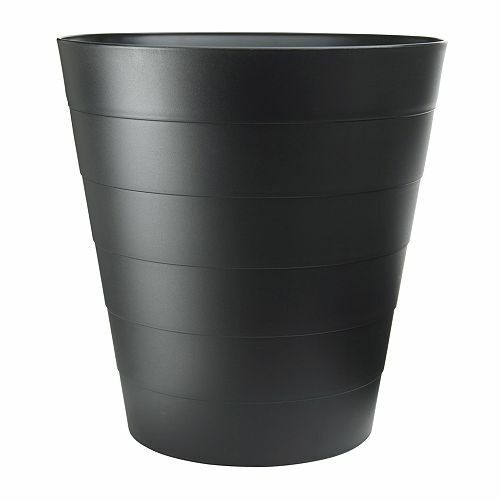 This would help with drainage and take up some of that space in the bottom of the pot. Finally, we just transferred in the plants, added some potting soil, and set each pot atop a plate to catch any draining water. A very cheap and easy solution. 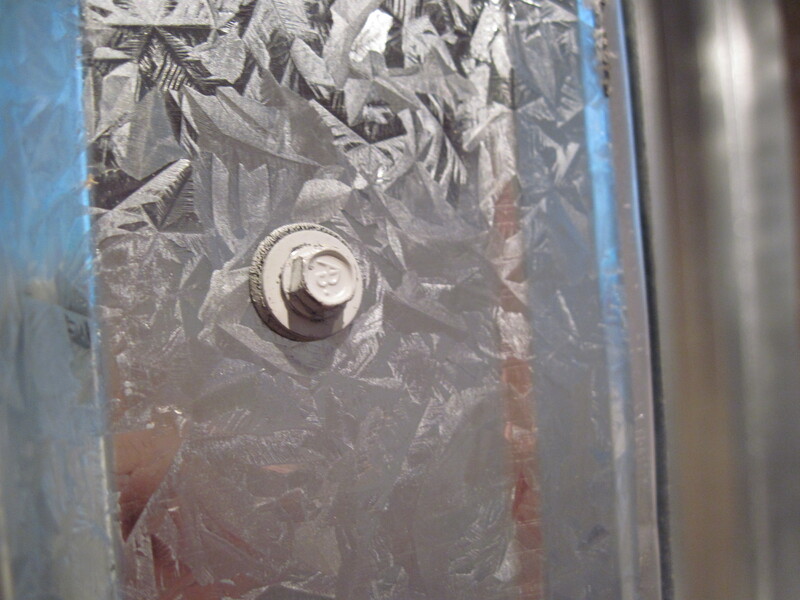 As we promised, here’s our complete run-down on how we installed our galvanized shower surround. 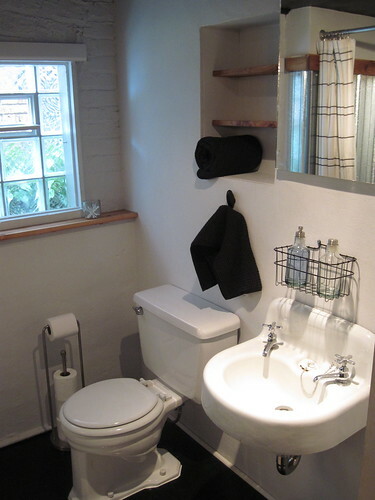 If you’ve followed us at all recently, you know we just upgraded our basement bathroom and took it from a dark and dated space to a clean, much-more-our-style type of place. Included in that complete redo was a new shower surround. 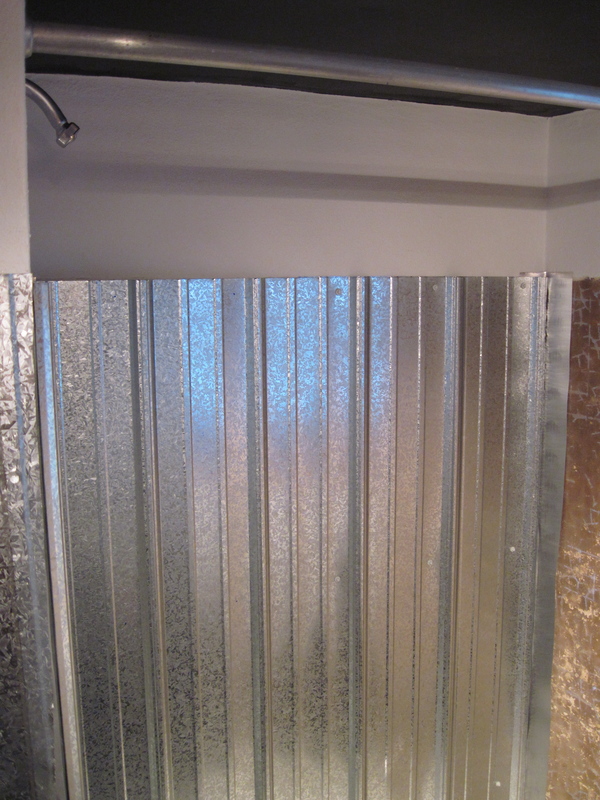 Inspired by a few pictures we’d seen in magazines and across the web, we decided to go with a galvanized corrugated metal shower surround. We knew we loved the look of this (industrial, modern, simple), but when we started searching for how to actually implement our new idea, we came up decidedly short. As we first do with any new project, we pulled out our go-to DIY sources and hit up our favorite websites for help. 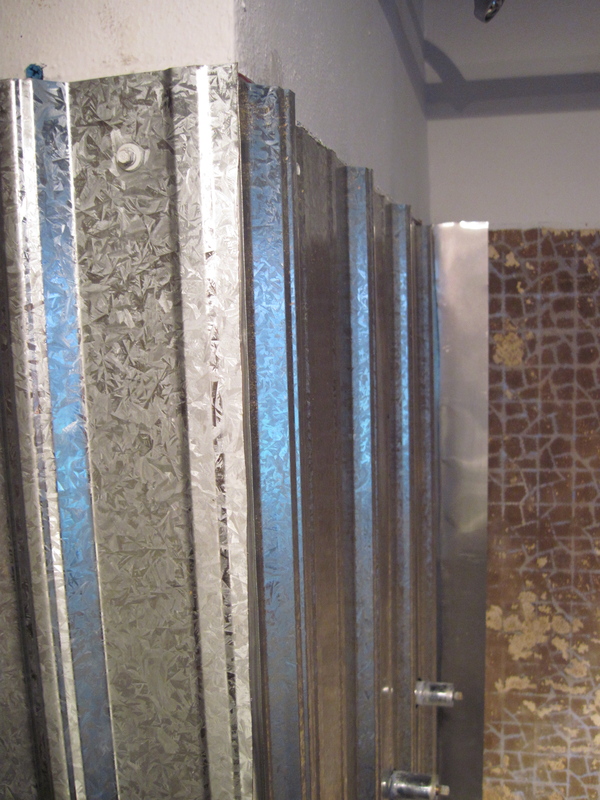 While we found a few discussions online on using galvanized metal for a shower surround, nowhere did we find very clear steps on how to implement it in our home. So, with a lot of trial and error, we muddled through it and came up with a system that worked for us. We’re pretty happy with the results, and we thought we’d share our process with you in hopes of helping out others out there with the same idea. 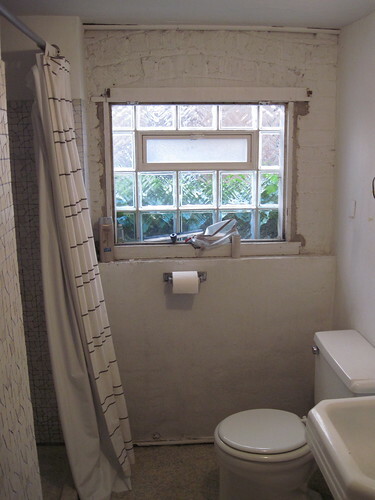 Here’s the steps we took to make our galvanized shower surround. Keep in mind, this is what worked for us and might not work out for your space. Tweak as needed, but hopefully this will serve as a good launching pad for your project. 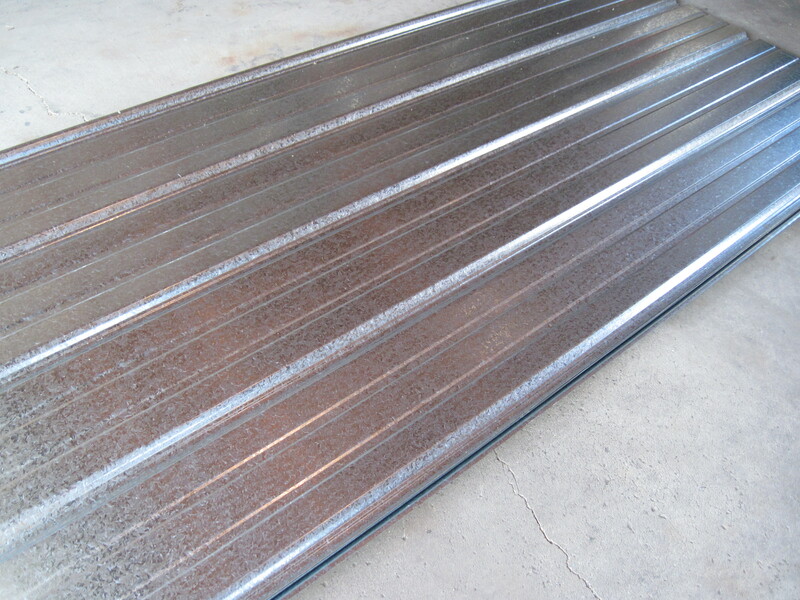 Sheets of Corrugated Metal – We ordered ours from a local chain hardware store. Other stores didn’t carry it. You may have to shop around a bit to find this, but odds are you can find it somewhere close by. Ours came in 3 foot widths at 8 feet long. Be sure to measure your space well and add about 5-10%. Polebarn Screws – These will be used to attach the panels to the wall. 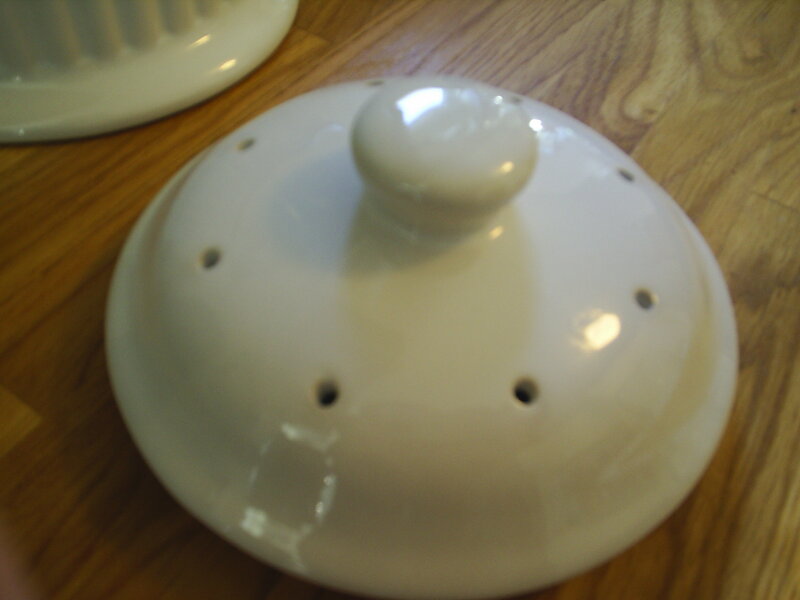 They have a self-sealing rim around the head of the screw that, once pressure is applied, keeps the hole watertight. We applied screws in a grid pattern of 1 foot apart horizontally and 2 feet apart vertically, so use this formula with your measurements to come up with the number of screws you’ll need. Odds are they’ll come in a box for about $5, which will be more than enough for your purposes. 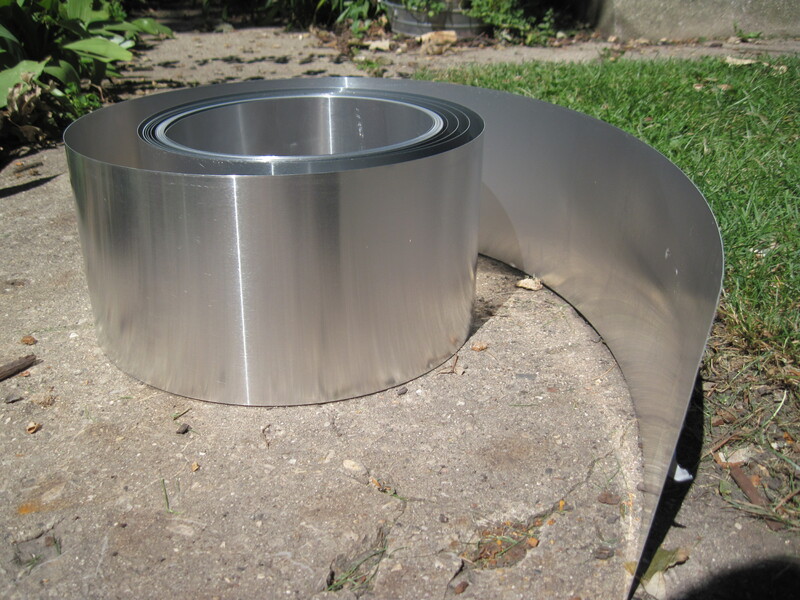 Aluminum Flashing – Figure out how much you’ll need by determining how many corners your sheets of metal will turn (in our case, four) and how tall your metal shower surround will be. 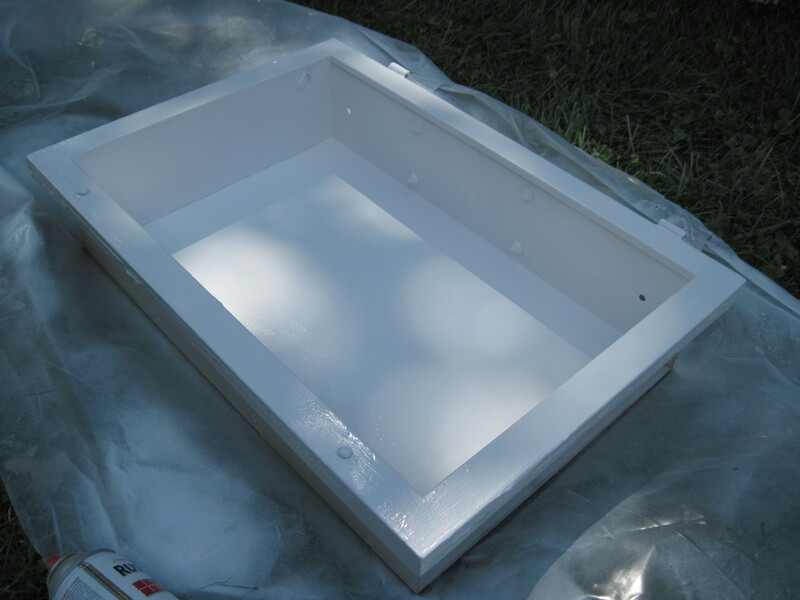 Caulk – We used a tube of white kitchen/bath caulk, clear silicone caulk, and aluminum flashing caulk in an aluminum color. We also used a tube of construction adhesive (Liquid Nails). Trim – This part is a matter of taste but also necessity. 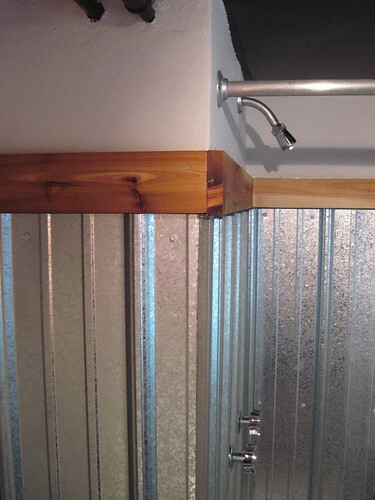 Corrugated metal won’t sit flush against your walls, and the tops (and maybe bottoms) will probably need to be trimmed out to keep water from getting behind it. We used cedar as our trim. 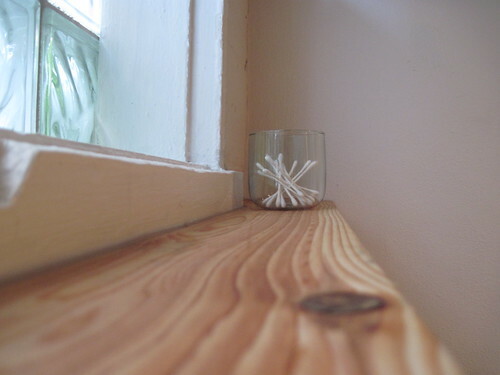 Finishing Nails – We used these for our cedar trim. 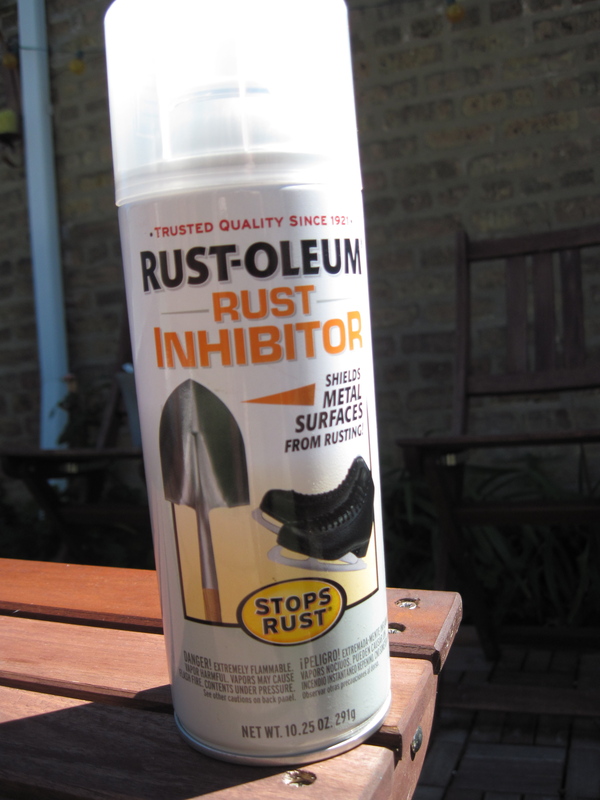 Rust Inhibitor/Sealer – We used Rust-O-Leum Rust Inhibitor, which prevents metal from rusting without paint. 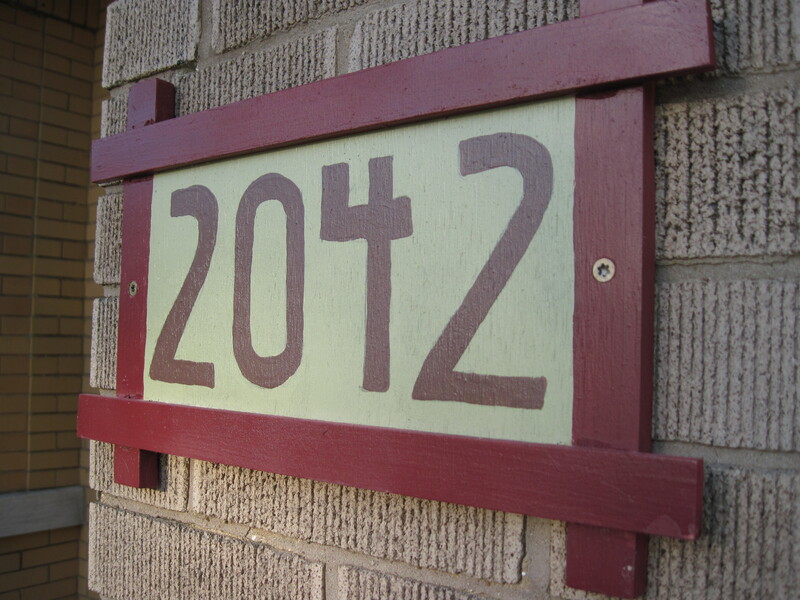 You could also use a form of polyurethane or some other type of spray-on clear coat. 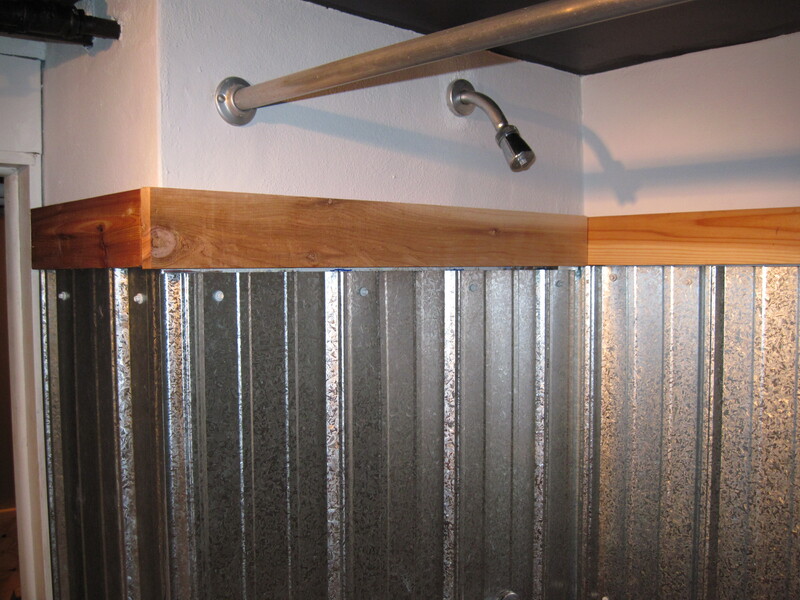 Measure – The first thing you should do is measure the area surrounding your shower or bath to determine how many panels of galvanized roofing material you will need. Like I mentioned, the panels we purchased were about 3 feet wide by 8 feet long. 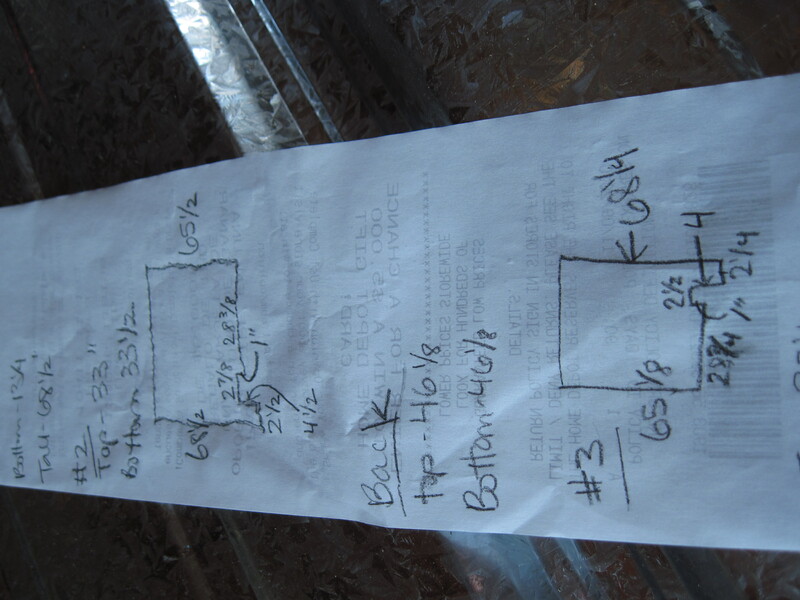 Make sure you know the size of your panels and use those measurements to determine how many to purchase. 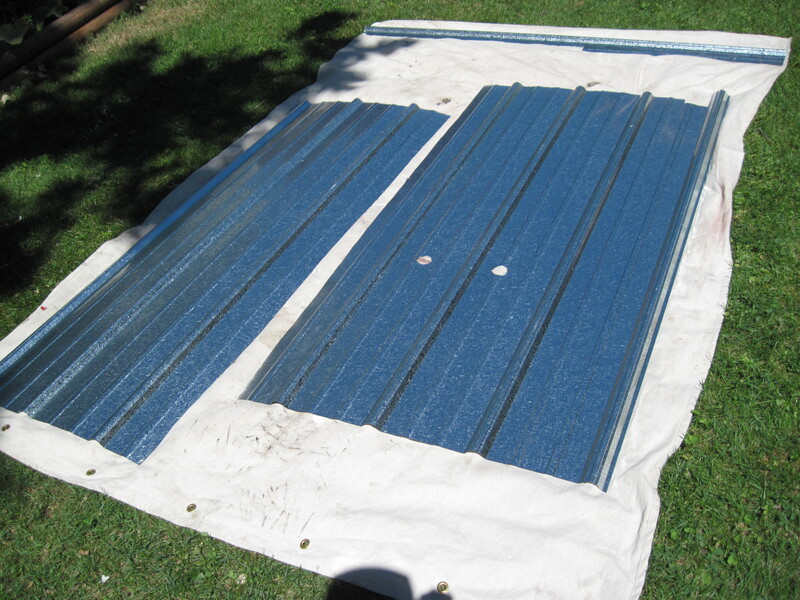 Purchase Galvanized Roofing Panels – Again, I ordered my panels from a local hardware store. 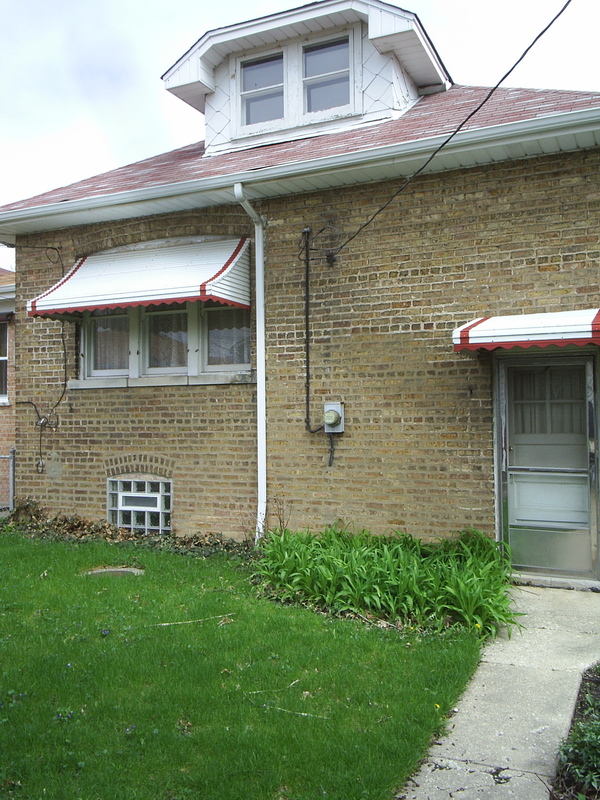 It was really inexpensive, which makes this project even more desirable. Shop around. Look for metal fabricators or roofing supply stores if you’re stumped. Cut the Panels to Fit – This is the tricky part. First, make sure you’ve measured well the space for the panels to fit. If your walls are pretty square, this could be an easier step. If they’re not (like ours! ), then you want to measure and measure again! Transfer those measurements to the panels and create a pattern around which to cut. There’s a few ways you can cut these. 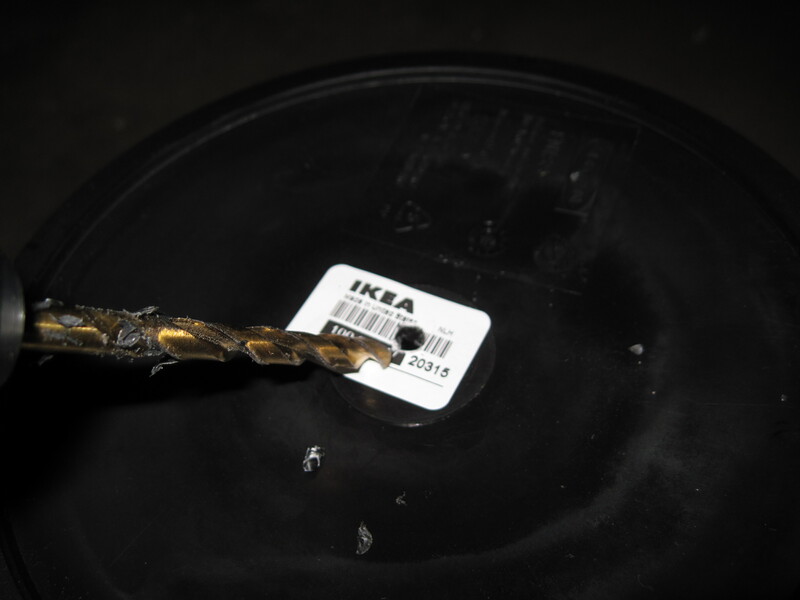 At first, we tried a sheet metal blade on a jigsaw, but that didn’t work at all! It broke before cutting even an inch. We also tried tin snips, but that ended up working best for only the small cuts. Eventually we landed on using a circular saw with a plywood blade turned backwards. 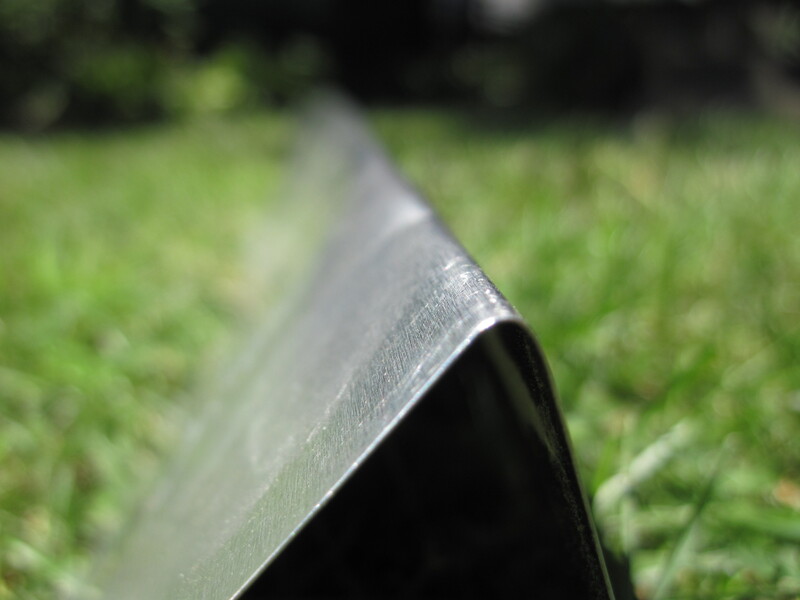 There’s something about putting the blade in the wrong way that made the easiest and cleanest cuts for us. A real word of caution here, though: Be sure to wear eye protection! It also wouldn’t hurt to wear long sleeves, long pants, and gloves. Cutting the metal this way creates a lot of sparks, and I ended up getting quite a few minor burns from it. 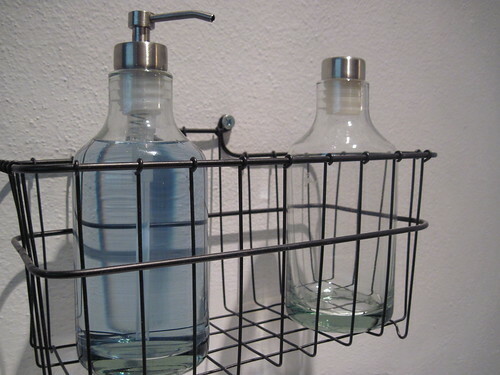 Also, trim the bottoms to fit around your shower basin or bathtub. This is where the tin snips might come in handy! 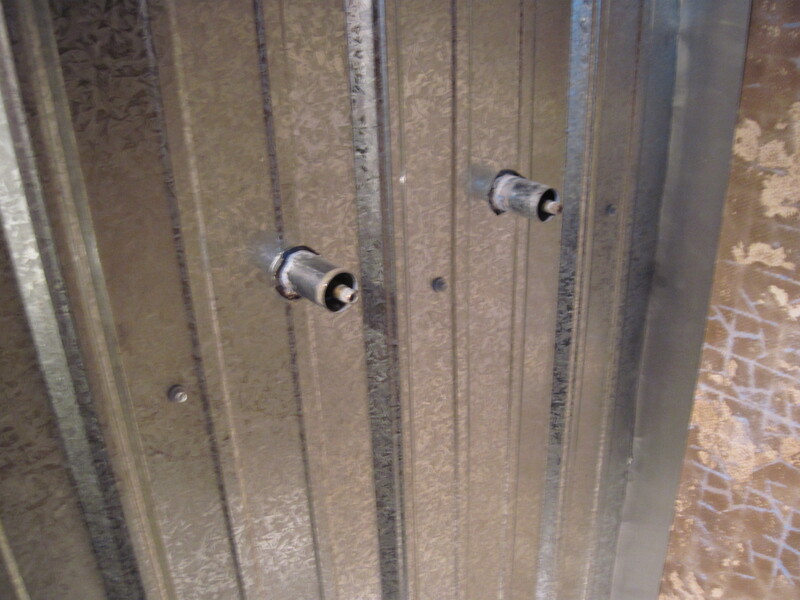 Seal Galvanized Panels – Like I said above, we used Rustoleum’s Rust Inhibitor to prevent our panels from rusting. 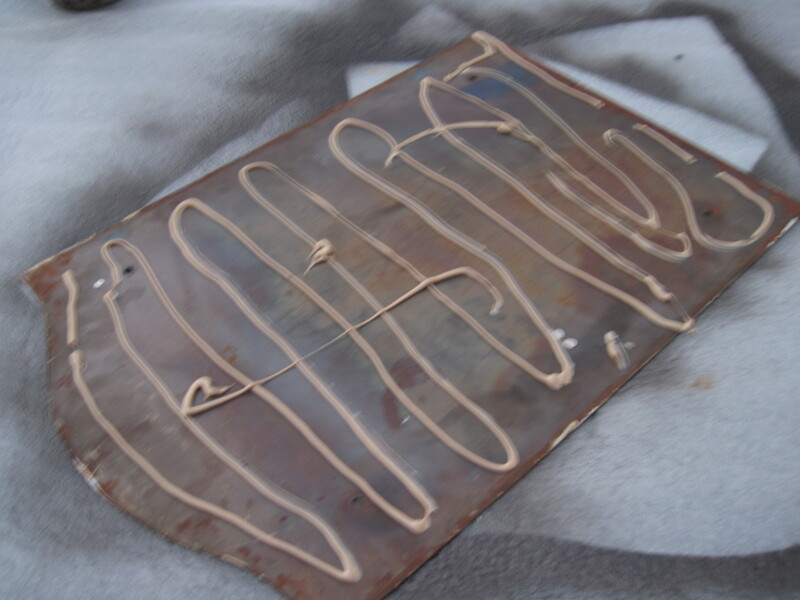 While these panels are designed to stand up to weathering, they will eventually rust. We’re hoping this keeps that at bay for a long time (if not indefinitely). We simply sprayed this on, wiped off the excess, and waited for it to dry. We plan to reapply once every year or so. Cut Out Around the Knobs – If you have knobs in the wall of your shower, you’ll need to trim the roofing panels to accommodate them. Remove the handles and place the panel against the wall. Determine where the handles will go by leaning the panel against the pipes and trace around them. I used a hole boring drill bit in a 1.5” size to cut out for the knobs. This was also a bit tricky. I placed the panel on a 2×4 and clamped it in place while I pressed hard against the panel with the drill bit and made the holes. 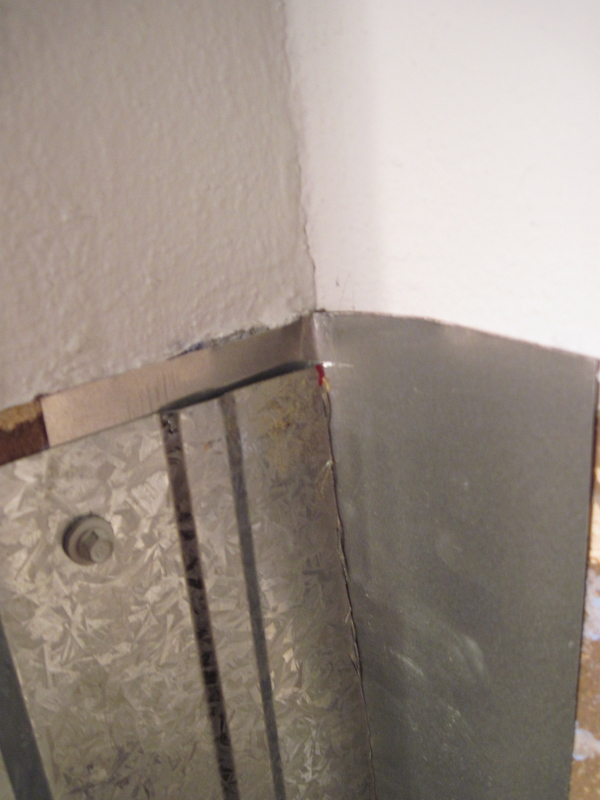 Cut Flashing for the Corners – To ensure that water doesn’t get behind the wall panels and mold the wall, you’ll want to put flashing in all the corners. This can be bought in a roll at any hardware store. Simply cut the flashing down to the appropriate size for your corners and, using a straight edge (such as the edge of a tabletop), bend the flashing into a 90 degree angle. Apply Flashing to the Walls – Using a little silicone caulk, adhere the flashing to walls in the corners. You may want to do this as you approach corners when applying the panels. The silicone might not be enough to permanently and instantly adhere the flashing to the walls, and if you apply the panels with screws over the flashing, it’ll be much easier to adhere it to the wall. 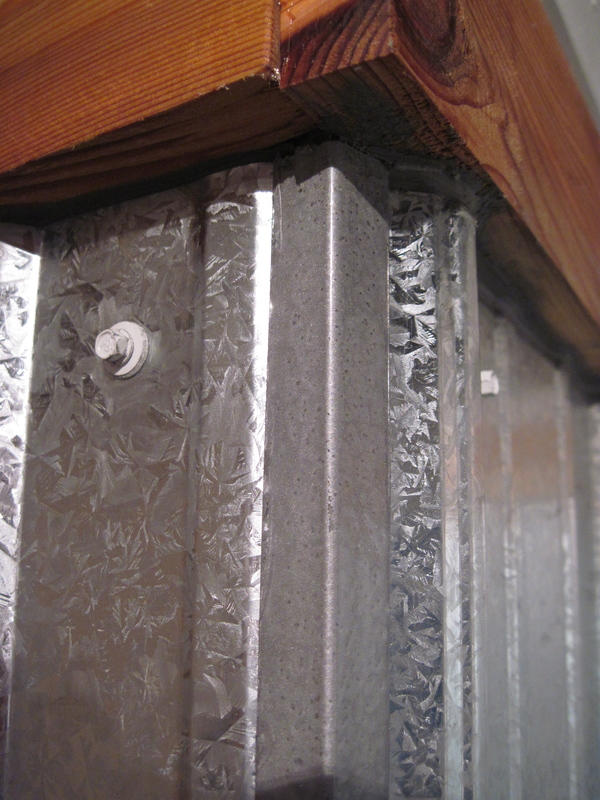 Apply Galvanized Panels to the Walls – Once the flashing is installed, you’re ready to apply the galvanized panels to the walls. For this, I used Polebarn screws, which are special screws with a self-sealing rim around the head. When firmly attached to the panels, a rubberized ring creates a watertight seal. We applied these every 1 foot horizontally and every 2 feet vertically. Trim the Tops of the Panels – For our surround, we used 1×4 cedar planks to trim out the top. Corrugated metal panels won’t sit completely flush against the wall, and to keep water from leaking behind them, we felt it was important to have a way of capping them off. We used cedar because of its imperviousness to rot, and we sealed it with a deck stain. You may want to use polyurethane or some sort of marine seal if you choose to go this route. We simply cut the cedar boards to fit, applied liquid nails to the backs, and attached them to the wall with decking screws and trim nails. I used decking screws to attach the rear trim piece to the wall and covered over the screw heads with the adjoining trim pieces. Then, we used trim nails to attach each portion of the cedar trim to the other. Caulk! – Finally, you’ll want to caulk all the seams and corners. 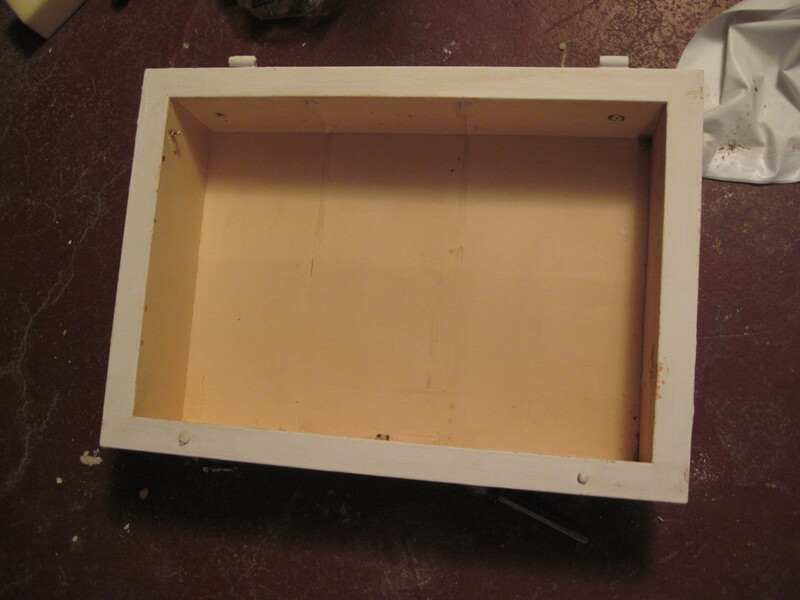 We ran large seams of clear silicone caulk in all of the inside corners and where panels overlapped. 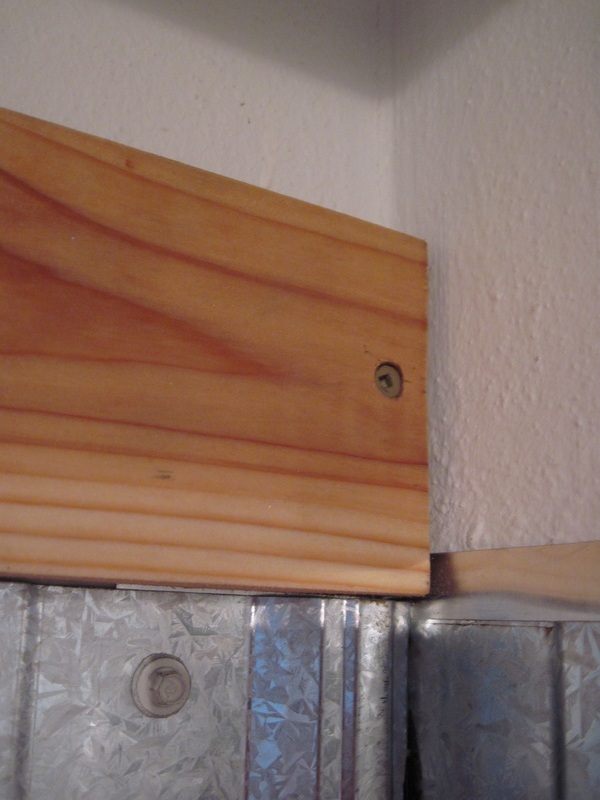 We also used aluminum caulk on the tops of the panels where they each met the cedar board above. Finally, I used Shower caulk in glossy white to fill the space between the bottom of the galvanized panels and the shower surround. 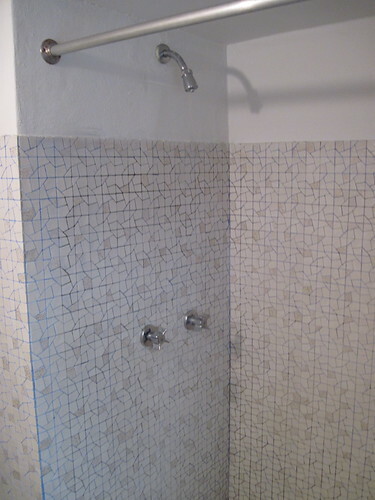 Depending on the size and shape of your shower and if you decide to continue the galvanized panels outside of the shower area, like we did, you may end up with some pretty sharp corners. On the outside of our shower, we had two panels meeting, which created a bit of a dangerous situation. To solve this, we used plastic corner guards, picked up at that hardware store. 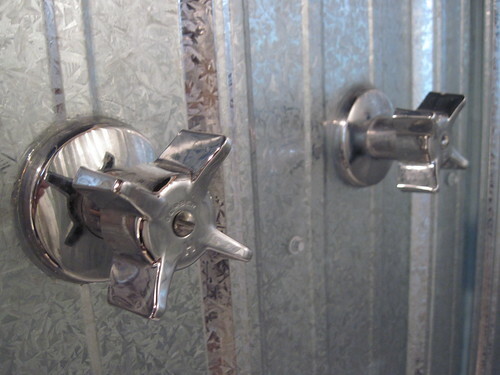 We used a plastic hammered silver spray paint to coat them, giving them the look of galvanized metal. Then, we used some of our caulk to adhere them to the corners to cover the sharp edge. It’s also worth noting that others (like these guys) have used Z-channel as a water barrier around the bottom of the galvanized panels. This is probably a very efficient way of prevent water behind your panels. Like I said, this is just what worked for us – experiment a bit and come up with a solution that fits your needs. That should do it! 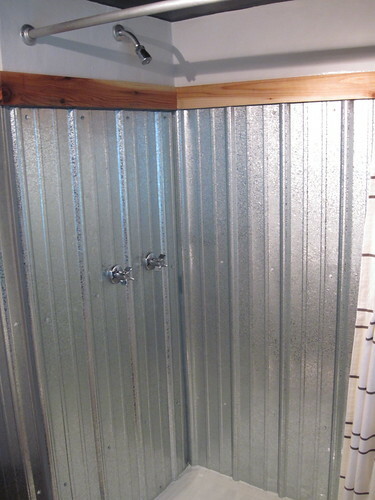 Hopefully this will get you well on your way to creating your own galvanized shower surround. Do us a favor, though. If you try this, please let us know and give us any tips on things you did differently or things that worked better for you. Good luck with it! 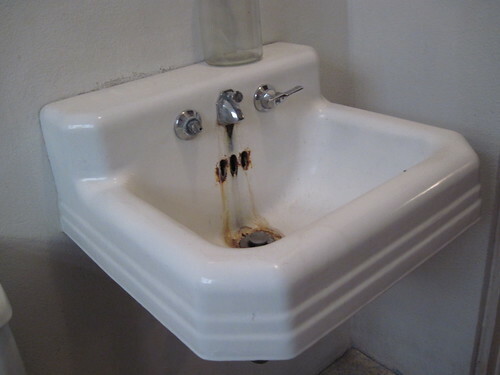 And the sink had seen better days. 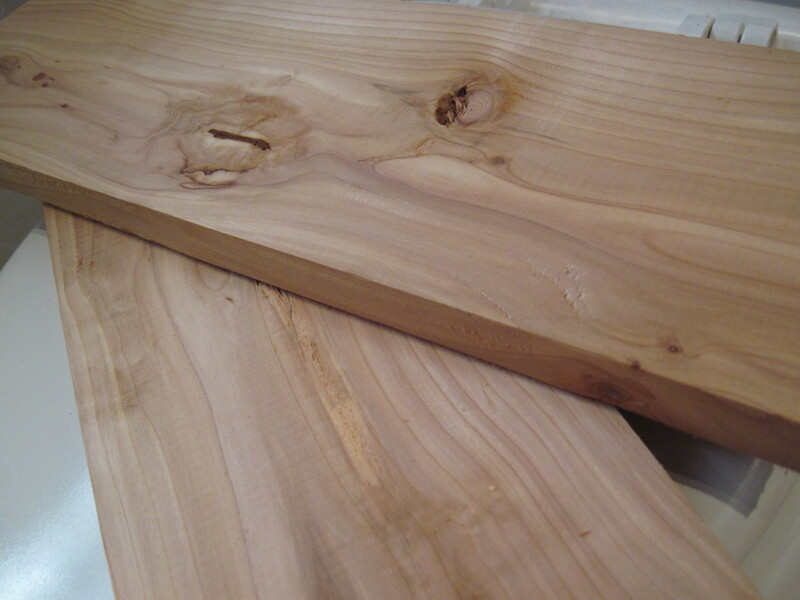 We used 1×4 pieces of cedar that we treated with Thompson’s Water Seal to trim out our new shower surround. We picked cedar, of course, because it’s rot-resistant. Hopefully the Water Seal will keep it from graying as well. We were also able to keep the existing shower head and faucet knobs to keep things as economical as possible. 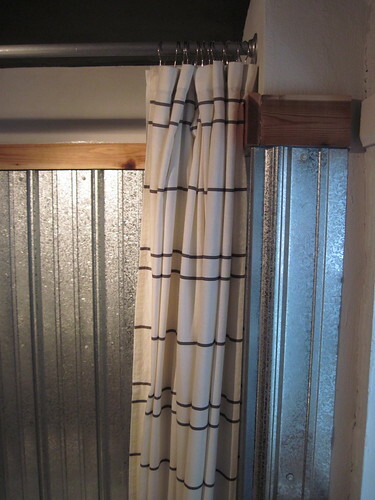 The shower curtain that we had hung in the bathroom originally also fit nicely into the new space. Down below, we simply coated the shower basin with a fresh coat of epoxy designed as a tub and tile refinisher. You might recall that we actually used the same stuff to turn our avocado green tilework in the upstairs bathroom to white. 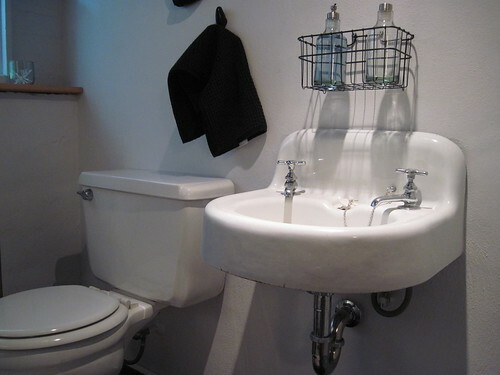 We had plenty left over from that job, so we used the same can to liven up this shower basin. It takes a few days to cure but is really easy work. It’s completely self-leveling, so any errant brushstrokes were totally hidden by the time it all dried. 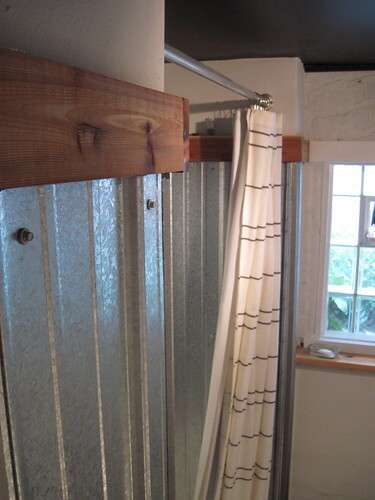 We extended the cedar trim and galvanized roofing panels outside the shower for the small spaces adjacent to it to keep some consistency on that side of the room. 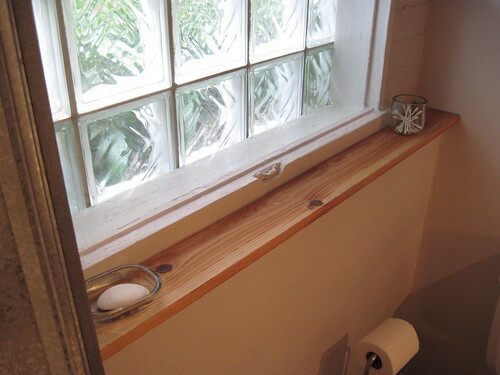 We also used cedar in the cutout section beside the medicine cabinet as well as along the ledge under the window to create extra shelving space. 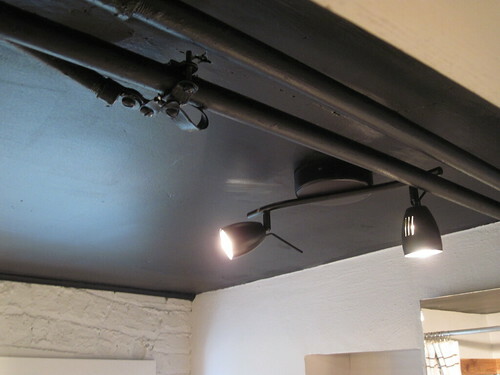 We also painted the ceiling black and replaced the bare overhead lightbulb with this great directional light. 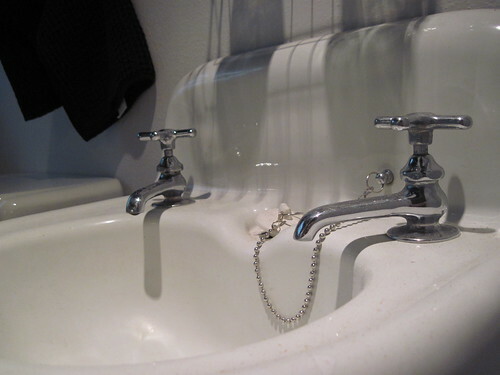 It creates a really nice effect in the bathroom (but makes for some pretty harsh shadows in photos – sorry about that!). Not bad, right? Granted, we ended up buying this IKEA sink for $75, which turned out to be a disaster, and we never used it. But, maybe we can pick up a few bucks on that by unloading it on Craigslist? Either way, we’re pretty satisfied! We’ve been composting for a while now, and we’re excited to finally use all that rich compost next spring when we begin gardening again. 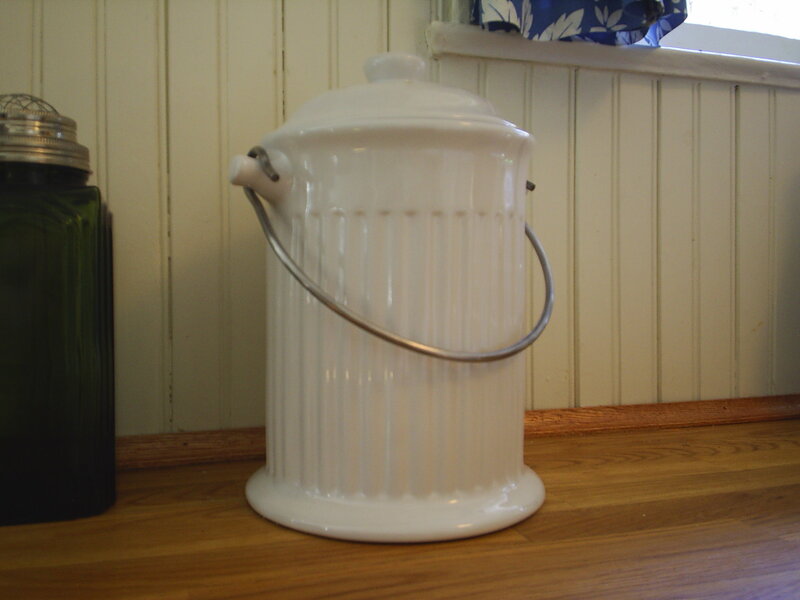 For a long time, we’ve kept all our food scraps and compostables in an old coffee can under the sink before taking them outside to our larger compost bin in the backyard. It wasn’t even one of those nice tin ones; it was a foiled carboard can. Needless to say, after several months, it had seen better days and smelled…well, not so great! Finally, we decided to upgrade to this ceramic model. While nothing super special, it’s a definite upgrade for us. It looks nice enough that we can keep it on the counter (since that’s where it usually ends up staying anyway). 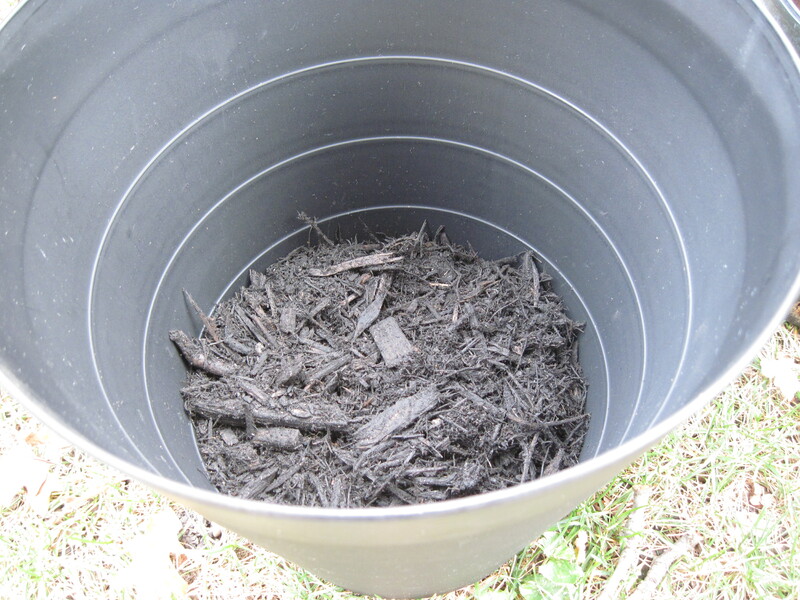 The lid allows air to get inside, which is necessary for a healthy compost. 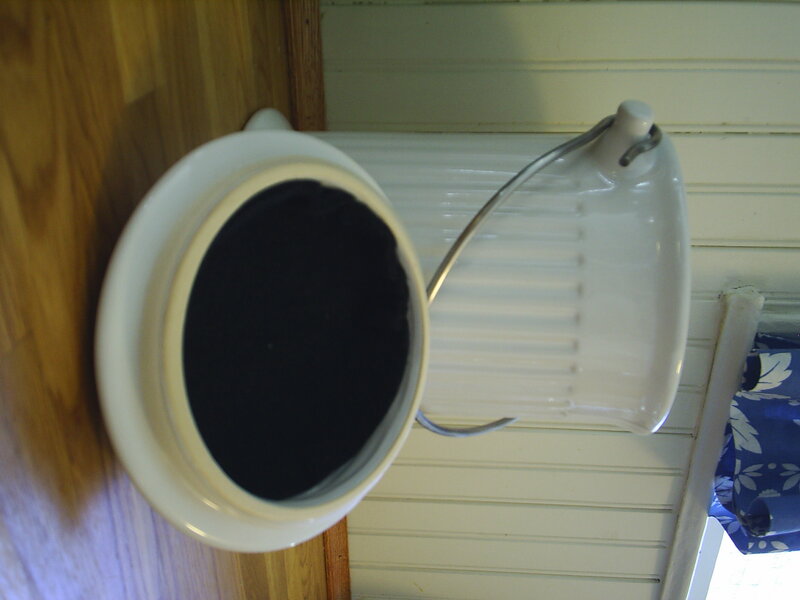 AND, most importantly, it has a nice, replaceable charcoal filter inside to keep the smells under control. A much, much better solution! We’re coming very close to being done with all the bathroom updates we’re making to our basement bathroom. 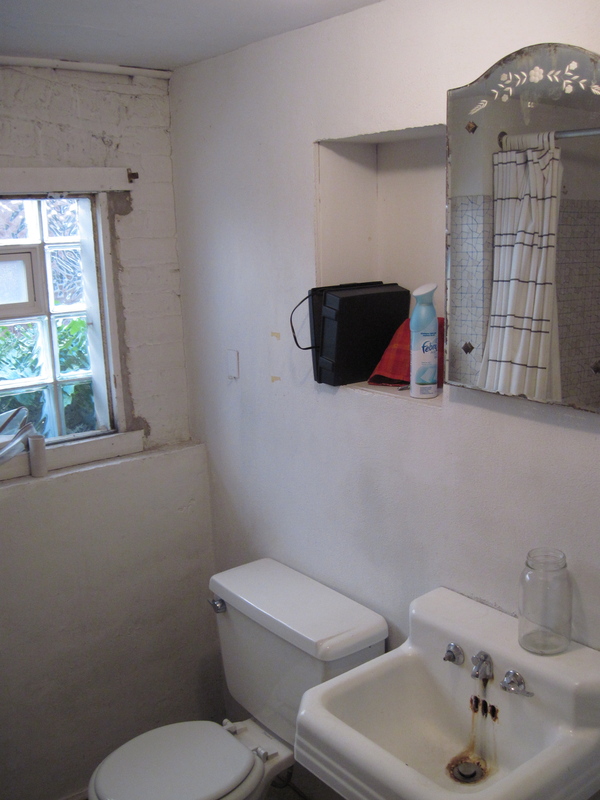 From installing a new (to us) sink to laying a new floor, we’ve done quite a bit to spruce up the dated and frankly creepy bathroom. That’s a shot from before we started any of the bathroom updates. 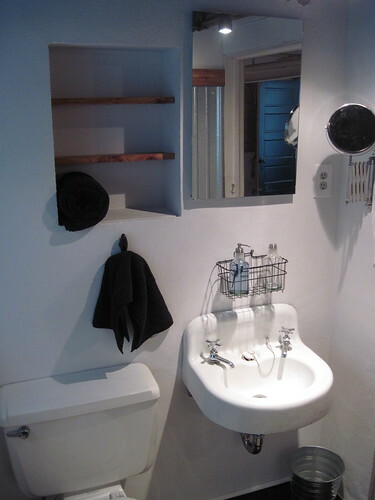 You can see the medicine cabinet above the sink there. It’s actually a pretty cool cabinet. It’s from 1923, has an etched pattern in the top, and is seriously heavy duty. We decided to keep it in the room, but change the mirror out and clean it up a bit to fit the room’s aesthetic. 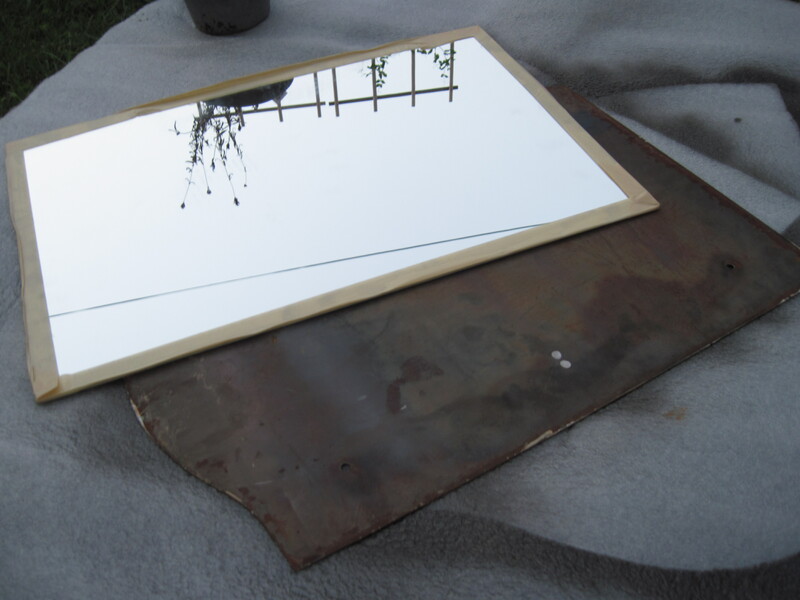 Don’t worry – we kept the great mirror and plan on incorporating it somewhere else. 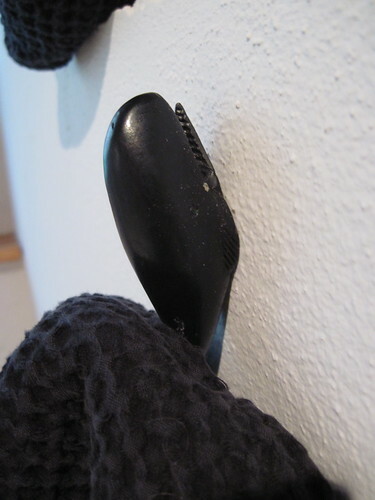 Then, the mirror easily came off of the door by removing the four screws holding it in place. We had a mirror cut to size at Lowe’s (did you know they’ll do that?) for under ten bucks. 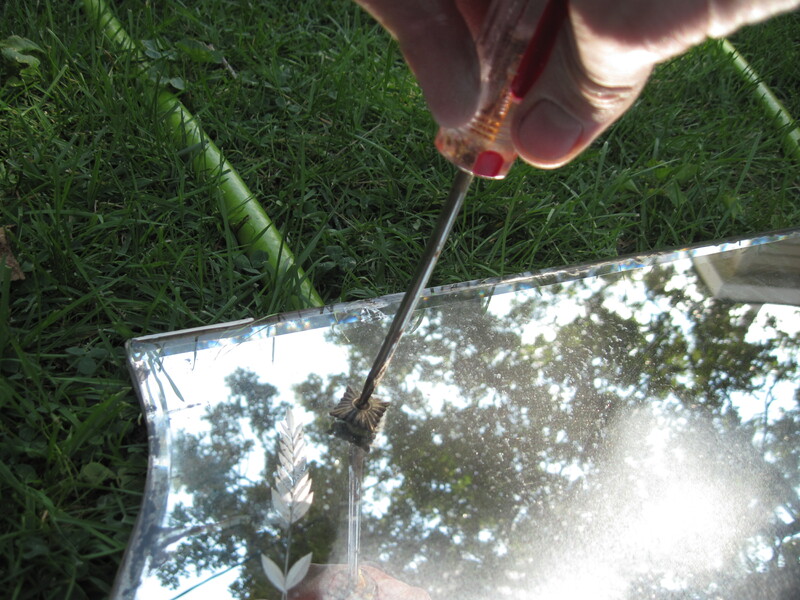 We also picked up a product called Mirror Mastic that’s like a glue to hold the mirror in place. 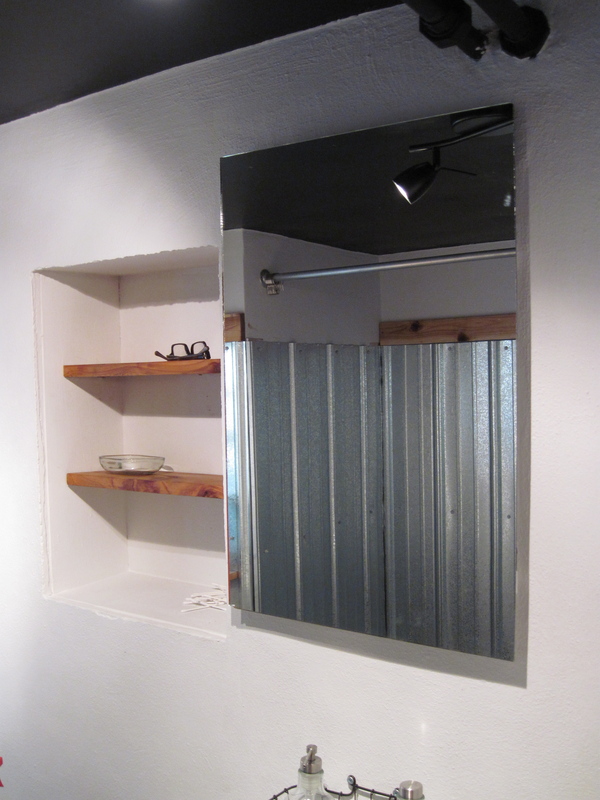 Oh, and in the mirror, you can catch a glimpse of the galvanized corrugated metal we’re putting in place as a shower surround. Here’s a bit of the work-in-progress. Stick around for a full reveal as well as a how-to (because we went through a lot of trial and error on that!). For the past few days, I’ve been painting and repairing our exterior windows. While the weather has been much cooler around here, I thought I’d take advantage of some time off to get some much-needed home repair done. 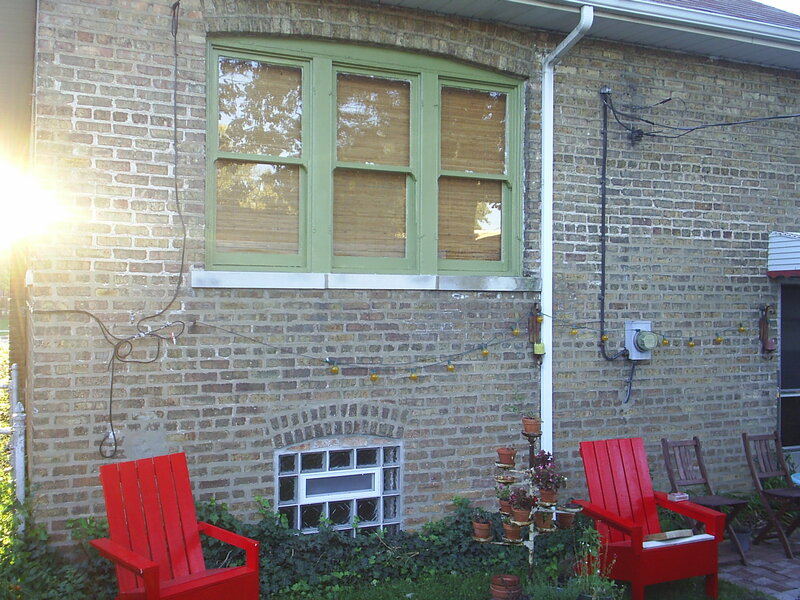 I painted the windows overlooking our backyard, and it occurred to me not only how much different the windows themselves look, but our entire backyard has undergone a complete change from when we first moved in a little over a year ago. This picture was taken before we even moved in. 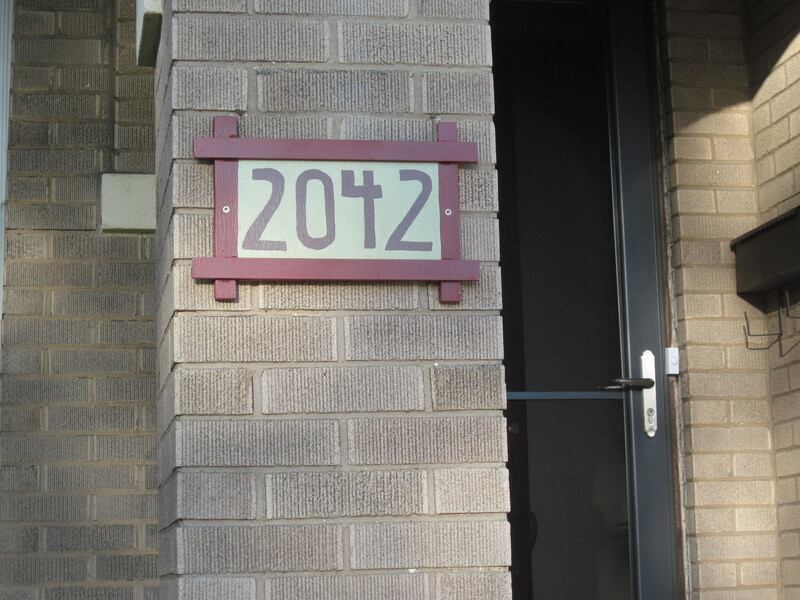 In fact, we took this picture for our home insurer for their records. We’ve since removed the awning over those three windows in the rear, and just yesterday, I painted them all a shade of mossy green, to match the trim in the front of the house. 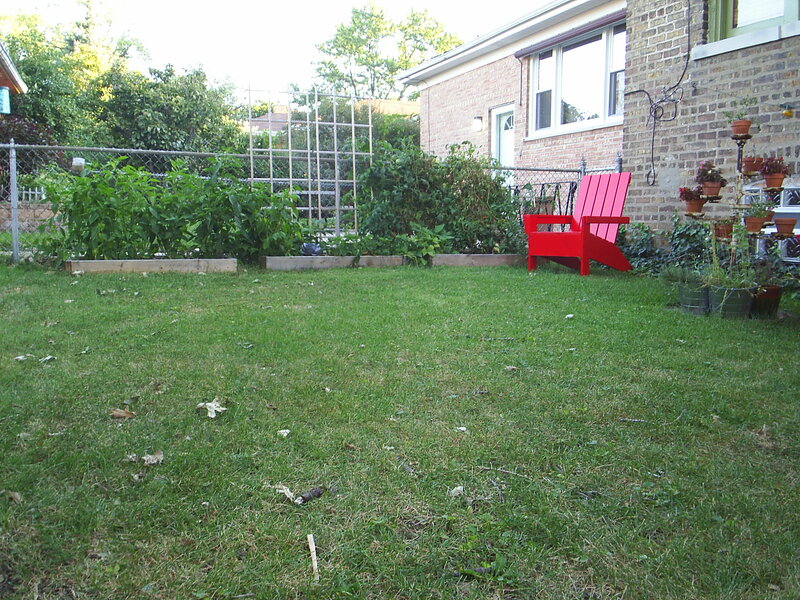 Here’s a few shots of the backyard as it looks today. 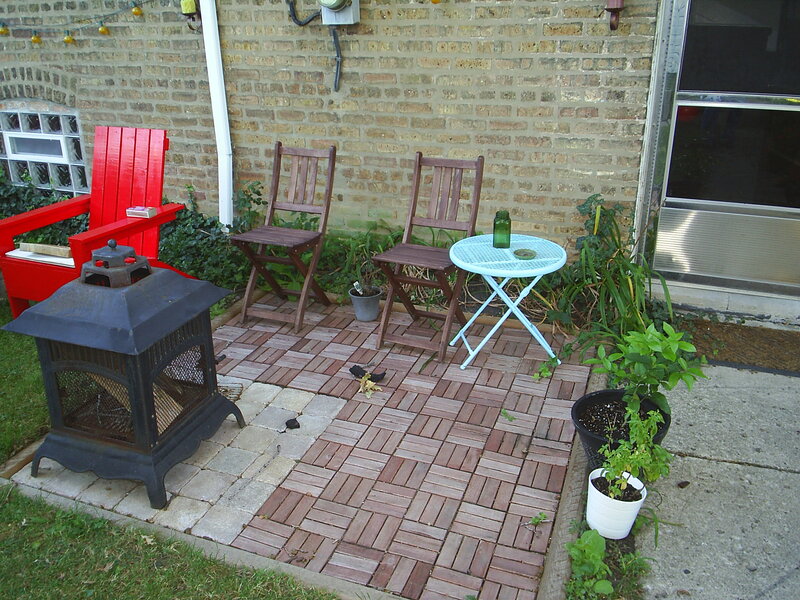 We’ve done quite a few things to upgrade the space, including gardening, making our own adirondack chairs, and installing a patio.